圖1. The Theater at Epidaurus on the Peloponnese in Greece. Science Daily — As the ancient Greeks were placing the last few stones on the magnificent theater at Epidaurus in the fourth century B.C., they couldn’t have known that they had unwittingly created a sophisticated acoustic filter. 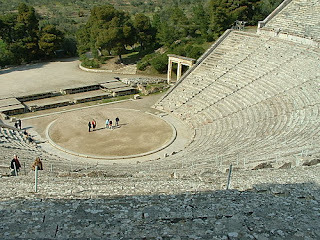 But when audiences in the back row were able to hear music and voices with amazing clarity (well before any theater had the luxury of a sound system), the Greeks must have known that they had done something very right because they made many attempts to duplicate Epidaurus’ design, but never with the same success. When Declercq set out to solve the acoustic mystery, he too had the wrong idea about how Epidaurus carries performance sounds so well. He suspected that the corrugated, or ridged, material of the theater’s limestone structure was acting as a filter for sound waves at certain frequencies, but he didn’t anticipate how well it was controlling background noise. But as Declercq’s team experimented with ultrasonic waves and numerical simulations of the theater’s acoustics, they discovered that frequencies up to 500 Hz were held back while frequencies above 500 Hz were allowed to ring out. The corrugated surface of the seats was creating an effect similar to the ridged acoustics padding on walls or insulation in a parking garage. So, how did the audience hear the lower frequencies of an actor’s voice if they were being suppressed with other background low frequencies? There’s a simple answer, said Declercq. The human brain is capable of reconstructing the missing frequencies through a phenomenon called virtual pitch. Virtual pitch helps us appreciate the incomplete sound coming from small loudspeakers (in a laptop or a telephone), even though the low (bass) frequencies aren’t generated by a small speaker. 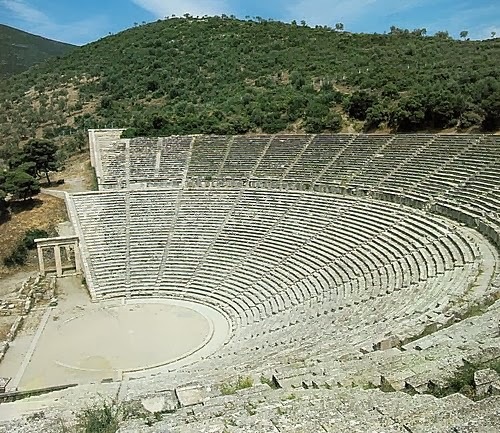 The Greeks’ misunderstanding about the role the limestone seats played in Epidaurus’ acoustics likely kept them from being able to duplicate the effect. Later theaters included different bench and seat materials, including wood, which may have played a large role in the gradual abandonment of Epidaurus’ design over the years by the Greeks and Romans, Declercq said. Note: This story has been adapted from a news release issued by Georgia Institute of Technology.